The Miami Centurion Lounge is one of the most popular lounges in American Express’ series of premium lounges for premium cardholders. 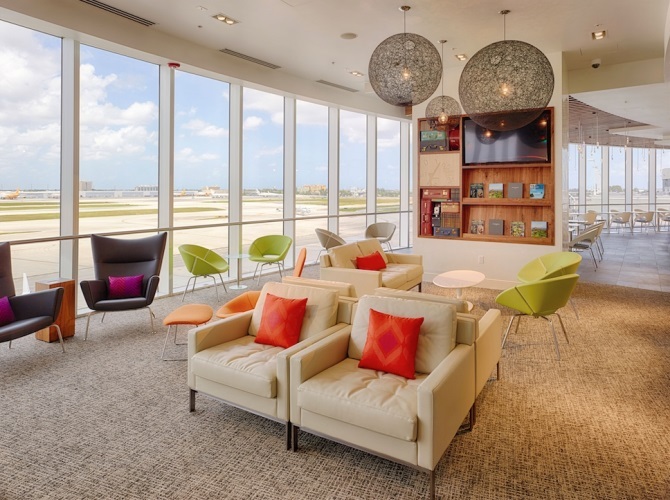 In the midst of American Airlines’ gigantic Miami hub, this lounge is frequented by business travelers heading to South America and beachgoers seeking some Florida sun. From the great atmosphere it offers to the amazing amenities at your fingertips inside, this lounge is a must-see in the Miami airport — and we’ll tell you why. Here, we’ll look at what the lounge offers, how to access it, and how to make the most of your experience. Who Can Enter the Miami Centurion Lounge? Located in Concourse D, near Gate D12, the Miami Centurion Lounge is a place like no other. To access the lounge, take the elevator up from the main concourse. It’s a bit hidden, so make sure to spot the elevators that will take you up — otherwise you can’t see the actual interior of the lounge from the gates. The lounge is located at the far end of the D terminal, so if your flight departs out of high-numbered D gates or another terminal, you can take the inter-airport train post-security, or walk (though it takes a while to walk the entire length of the D terminal). This lounge is open from 5 am to 10 pm for travelers who have layovers or connecting flights. It’s not available to those who have just landed. Children under age 2 can enter free of charge. If you wish to bring guests who are not Platinum Card® members, 2 guests are allowed to enter (but must be with the cardholder at all times). Hot Tip: Always double-check with the lounge before arriving in regards to bringing guests to avoid any disappointment — sometimes capacity restrictions prevent extra folks from getting in. The Centurion Lounge staff in Miami are polite and approachable, but they follow their rules to a T.
It’s very important to note that you cannot access the lounge prior to 3 hours before your departing flight. If you have a flight from Miami to Los Angeles, for example, that departs at 3 pm, you cannot access the lounge before noon that day. This rule helps prevent overcrowding. In addition, you cannot access the lounge when arriving into Miami, except for connecting flights. Let’s say you have an overnight redeye flight from South America to Miami, and Miami is your final destination — you won’t be able to catch a shower before heading home or into work. 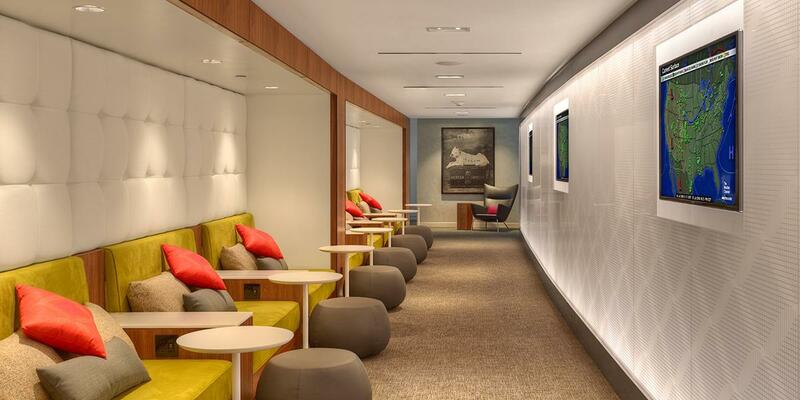 If you’re connecting in Miami to another flight, however, you will be able to access the lounge (since you’re still considered a departing traveler). The lounge was recently expanded to help accommodate more guests. 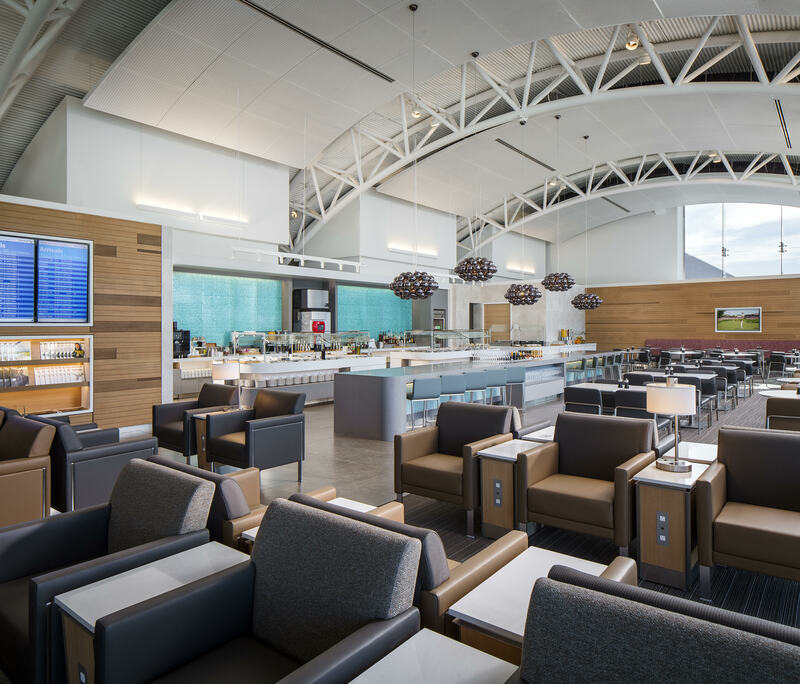 You’ll find several separate seating areas, most overlooking the surrounding runways and terminals. There are plenty of seats to relax or work, and you shouldn’t have much difficulty finding a place to sit (especially since the renovation). Seating is plentiful in the newly renovated Miami Centurion Lounge by American Express. Image courtesy of American Express. As you enter the lounge, you’ll see shower facilities off to the left. Each shower room has a toilet, sink, shower, and bench to place your clothes on. Everything is included: soap, towels, and other basic amenities such as toothpaste or mouthwash can be requested if you don’t see them in your room. The shower facilities are first come, first served by waitlist. If there’s no wait, you’re free to check-in at the front desk and they’ll open up one of the shower rooms for you. If you’re placed on the list, all of the folks ahead of you have 30 minutes each to use the room — as the staff cleans the room following usage, you’ll be called. Hot Tip: If there’s a wait and you’re not one of the first few on the list, it can take quite a while for a shower room to open up. If your flight is departing within an hour or so, don’t wait — you might miss your flight! The family room area is a pretty unique concept for a lounge in the United States. Complete with colorful furniture and some basic games, toys, and distractions, it’s the perfect place for kids to hang out while their parents relax in the spa (or the bar). The family room doesn’t need to be reserved — just walk on in! Got kids? 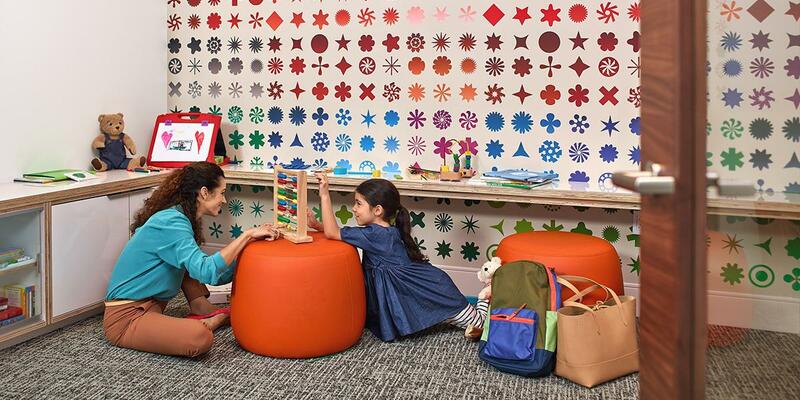 Let them enjoy a little downtime before your flight at the Centurion Lounge family room. No reservations are needed. Image courtesy of American Express. This lounge doesn’t have a true conference room, so if you’re trying to get work done with colleagues, you should plan on grabbing seats together. There are semi-private workspaces and seating arrangements, though it can be hard to find several seats together if the lounge is extra crowded. Hot Tip: If you’re looking for a “hidden” spot of seats, there are a few seats on the left as you go toward the shower facilities. These seats are rarely used since most folks don’t notice them. If you’re without a seat elsewhere in the lounge, this is a good last resort (though it’s not near the food or bar). The cuisine at the Miami Centurion Lounge is designed by James Beard Award-winning chef Michelle Bernstein. You’ll find fresh local dishes for breakfast, lunch, and dinner that will have your taste buds dancing. Breakfast can be enjoyed from 6 am to 11 am, and lunch and dinner are available from 11:30 am to 10 pm. In addition to the menu items, members can order snacks like fruit, chips, and cookies, which are especially appetizing to kids that may be visiting the lounge. All the food prepared in the lounge is done in-house, so you’ll surely experience a delicious meal no matter what you choose. Treat yourself to a fantastic cocktail made in the lounge by one of the top mixologists, Jim Meehan, or indulge in a classy handpicked wine. One of the many drinks you can enjoy is a 305 Special, which mixes Casa Dragones Blanco Tequila, Aperol, lime juice, and grapefruit juice. Or you can enjoy a Key Lime Gimlet or Collins Avenue Collins, both of which use delicious liquor blends and juices. If these featured drinks aren’t up your alley, request a different cocktail — your bartender will be more than happy to mix one up for you. Non-alcoholic drinks available include sodas, coffee, peach-mango iced tea, and unsweetened iced tea. Throughout the lounge, the decor is a mix of modern, chic, and naturalistic. The lighting is soft but airy thanks to the many windows, and the atmosphere is laid back yet sophisticated. Members will feel like they can relax, but still get work done if they need to. Hot Tip: At the bar, you’ll find a perfect place to do some plane-spotting out the window. It’s really a fantastic view where you can watch aircraft take off and land. Spa treatments range from facials to massages, and are available to both men and women of all ages. Members get 15 minutes of free spa treatments, and you can pay extra if you or your guests want more time. Refresh yourself before your flight at the Miami Centurion Lounge Spa. Image courtesy of American Express. Outside alcoholic beverages and food are not allowed to be brought into or taken out of the lounge. Chewing tobacco, smoking, and vaping are not allowed. Airline employees cannot wear their airline uniform or any related regalia inside the lounge (to prevent folks from using the lounge during on-duty hours). If you’re traveling with a pet, service animals and regular companions are allowed to enter the lounge. They must be leashed at all times and never left without supervision. Call ahead to check with the lounge before assuming you can bring your pet to avoid any disappointment. The next time you find yourself in Miami, be sure to check out the Centurion Lounge. You already know Miami is one of the hippest cities in the world — don’t let your airport experience be anything but! With the lounge having expanded to include a lot more seating options, it really is a great place to relax before a flight. The complimentary buffet, top-shelf liquor, and spa facilities really do make a positive impression (you won’t be disappointed). The Miami Centurion Lounge is one of the nicest lounges in this airport, and it rivals the American Airlines Flagship Lounge located in the same terminal (only accessible to first and business class flyers, plus Oneworld Emerald and Oneworld Sapphire customers). If you don’t already have the Platinum Card® from American Express, think about adding it to your repertoire so you can be admitted to this oasis in a busy airport. What credit card do you need to enter the Centurion Lounge?